The Global Volcanism Program has no activity reports for Los Humeros. The Global Volcanism Program has no Weekly Reports available for Los Humeros. The Global Volcanism Program has no Bulletin Reports available for Los Humeros. Los Humeros is the easternmost of a series of silicic volcanic centers with active geothermal systems located north of the axis of the Mexican Volcanic Belt. 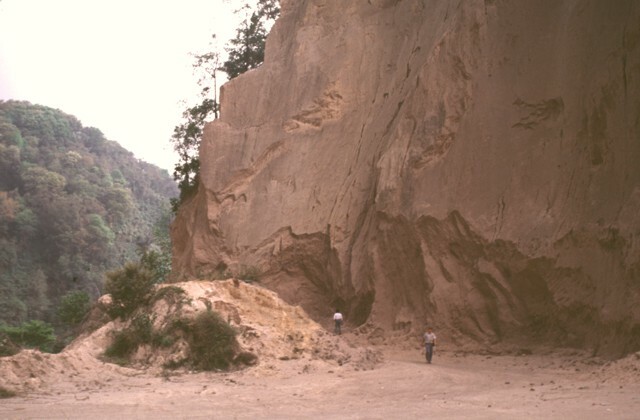 The first major silicic eruption produced the 230 km3 Xáltipan Ignimbrite about 460,000 years before present (BP), which covered about 3500 km2 and resulted in formation of the 15 x 21 km Los Humeros caldera. The emplacement of post-caldera lava domes and eruption of the 40 km3 Faby Tuff about 240,000 years BP was followed by eruption of the Zaragoza Tuff about 100,000 years BP and formation of the nested 10-km-wide Los Potreros caldera. A third and much smaller caldera (El Xalapazco) was formed about 40,000-20,000 years BP. The most recent eruptions include the production of extensive morphologically youthful basaltic lava flows that are undated, but are younger than a 20,000 BP rhyolitic lava flow and could be in part of early Holocene age. A major explosive eruption about 6400 years ago produced the bimodal plinian Cuilcuiltic Member tephra. Hot springs and fumarolic activity continues, which is a producing the second geothermal field developed in the Mexican Volcanic Belt. Campos-Enriquez J O, Arredondo-Fragoso J J, 1992. Gravity study of Los Humeros caldera complex, Mexico; structure and associated geothermal system. J. Volcanol. Geotherm. Res., 49: 69-90. Carrasco-Nunez G, Branney M J, 2005. Progressive assembly of a massive layer of ignimbrite with a normal-to-reverse compositional zoning: the Zaragoza ignimbrite of central Mexico. Bull Volcanol, 68: 3-20. Ferriz H, Mahood G A, 1984. Eruption rates and compositional trends at Los Humeros Volcanic Center, Puebla Mexico. J. Geophys. Res, 89: 8511-8524. Ferriz H, Mahood G A, 1987. Strong compositional zonation in a silicic magmatic system: Los Humeros, Mexican neovolcanic belt. J Petr, 28: 171-209. Martinez-S R G, Jacquier B, Arnold M, 1996. The delta 34S composition of sulfates and sulfides at the Los Humeros geothermal system, Mexico and their application to physicochemical fluid evolution. J. Volcanol. Geotherm. Res., 73: 99-118. Mooser F H, 1972. The Mexican Volcanic Belt: structure and tectonics. Geof Internac, 12: 55-70. Negendank J F W, Emmermann R, Krawczyk R, Mooser F, Tobschall H, Werle D, 1985. Geological and geochemical investigations on the eastern Trans-Mexican Volcanic Belt. Geof Internac, 24: 477-575. Prol-Ledesma R M, 1998. Pre- and post-exploitation variations in hydrothermal activity in Los Humeros geothermal field, Mexico. J. Volcanol. Geotherm. Res., 83: 313-333. Verma S P, 1983. Magma genesis and chamber processes at Los Humeros Caldera, Mexico; Nd and Sr isotope data. Nature, 302: 52-55. Verma S P, 1984. Alkali and alkaline earth element geochemistry of Los Humeros Caldera, Puebla, Mexico. J. Volcanol. Geotherm. Res., 20: 21-40. Verma S P, 2000. Geochemical evidence for a lithospheric source for magmas from Los Humeros caldera, Puebla, Mexico. Chem Geol, 164: 35-60. Verma S P, 1985. Heat source in Los Humeros geothermal area, Puebla, Mexico. Trans Geotherm Res Council, 9(Part 1): 521-526. Verma S P, Lopez-Martinez M, 1982. Geochemistry of Los Humeros caldera, Puebla, Mexico. Bull Volcanol, 45: 63-79. There is no Deformation History data available for Los Humeros. There is no Emissions History data available for Los Humeros. Los Humeros caldera on the horizon to the NW is the site of the Los Humeros geothermal field, the easternmost in México. The geothermal field was first studied in 1958, and exploratory drilling was carried out in 1981. A geothermal plant has been operating at Los Humeros since June 1990. The plant has seven 5-MW backpressure units, the last of which went online in 1993. In 2001 the production was assessed at 42 MW. The wells range in depth from 1600 to 2225 m, and their temperatures reach 400°C, the highest recorded in México. Photo by Lee Siebert, 1999 (Smithsonian Institution). The light-colored area just below the right-hand horizon is the floor of the 15 x 21 km Los Humeros caldera. It is seen here from the SE across the Serdán-Oriental basin from the flanks of Cofre de Perote volcano. Caldera formation during the mid-Pleistocene was followed during the late-Pleistocene or Holocene by extrusion of voluminous lava flows down the flanks of the volcano. These flows form the dark-colored band extending across the basin almost to the left-hand side of the photo. The peak in the left distance is Cerro Pizarro. A quarry wall on the lower NW flank of Cofre de Perote volcano exposes a cross-section through part of the Xáltipan Ignimbrite from Los Humeros volcano. 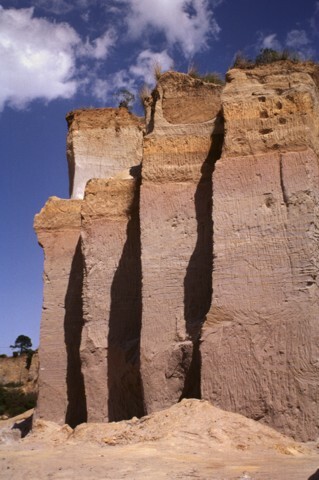 The massive 230 cu km ignimbrite was erupted about 460,000 years ago and resulted in the formation of Los Humeros caldera. The voluminous ignimbrite covers a 3500 sq km area and extends at least 50 km to the coastal plain. The mostly non-welded rhyolitic ignimbrite is overlain by co-ignimbrite airfall tuffs and eight airfall lapilli tuffs. 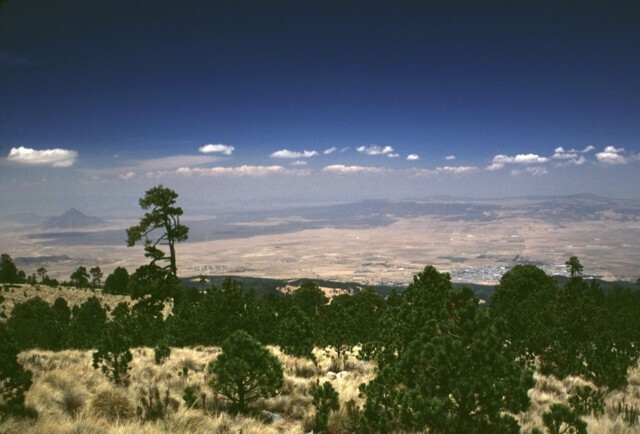 During the late-Pleistocene or Holocene, voluminous andesitic and basaltic-andesite lava flows erupted from scoria cones on the southern caldera rim and flowed long distances down the southern flank of the caldera. The age of the flows is not known precisely, but the roughly 6000-year-old archaeological site Cantona seen in this photo was constructed on top of the flows. A weather cloud on the horizon drifts from the summit of Cerro Pizarro, the northernmost lava dome of the Serdán-Oriental volcanic field. Photo by Gerardo Carrasco-Núñez, 1995 (Universidad Nacional Autónoma de México). A quarry along the road between Teocelo and Cosautlán de Carbajal SE of Cofre de Perote volcano exposes thick deposits of the 230 cu km Xáltipan Ignimbrite from Los Humeros volcano. This outcrop lies about 50 km SE of Los Humeros, beyond the Pico de Orizaba-Cofre de Perote range, much of which post-dates the 460,000-year-old rhyolitic ignimbrite. Eruption of the Xáltipan Ignimbrite, which covered an area of about 3500 sq km, resulted in the formation of a 15 x 21 km wide caldera. Photo by Lee Siebert, 2000 (Smithsonian Institution). 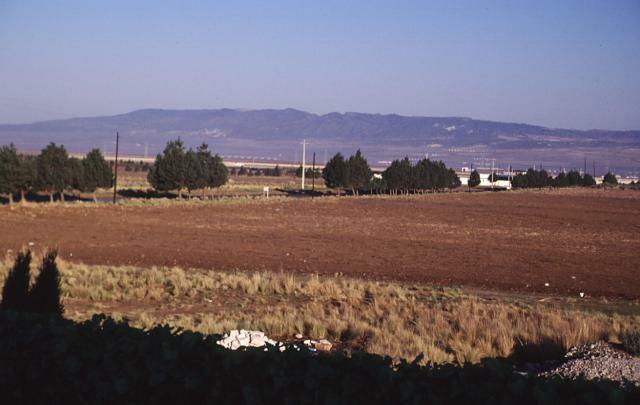 The broad ridge in the distance to the NW is Los Humeros, the easternmost of a series of large silicic volcanic centers with active geothermal systems located north of the axis of the Mexican Volcanic Belt. Eruption of the Xáltipan Ignimbrite about 460,000 years ago resulted in formation of the 15 x 21 km Los Humeros caldera. The most recent eruptions at Los Humeros produced extensive morphologically youthful, but undated basaltic lava flows. Hot springs and fumarolic activity continue at Los Humeros, which is a producing geothermal field. 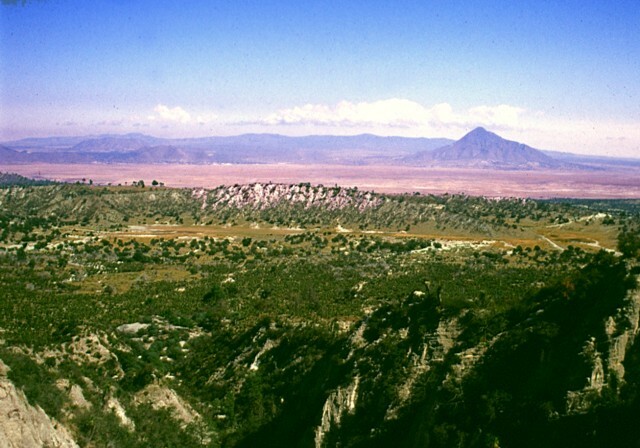 The summit of Cerro Pinto lava dome on the western side of the Serdán-Oriental basin provides an overview of the dry crater floor of Cerro Xalapaxco tuff cone in the foreground. Pyroclastic-surge deposits associated with Cerro Xalapaxco were deposited in a relatively dry eruptive environment. The sharp-topped peak at the far right is Cerro Pizarro, a lava dome at the northern end of the Serdán-Oriental. 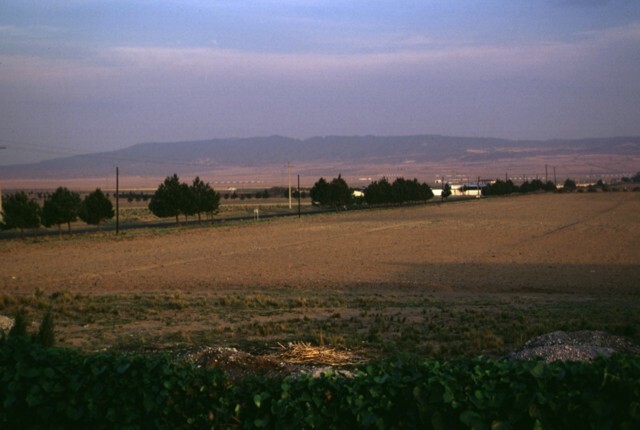 The flat ridge stretching across the horizon to the north is Los Humeros caldera. Photo by Gerardo Carrasco-Núñez, 2002 (Universidad Nacional Autónoma de México). The fresh-looking lava flows at the top of the image were erupted from Los Humeros caldera (just out of view to the north). The basaltic and andesitic lava flows extend up to about 15 km from the caldera rim. The flows have not been dated precisely, but are younger than 20,000 years and could in part be of Holocene age. 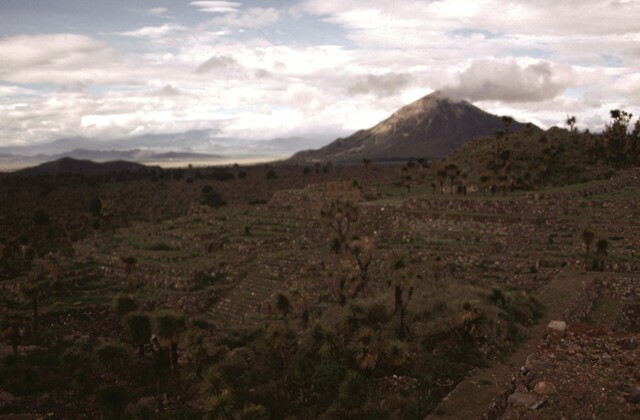 The Tepeyahualco (left) and Limón (right) lava flows bracket circular 3100-m-high Cerro Pizarro lava dome (right center), the northernmost feature of the Serdán-Oriental volcanic field. NASA Landsat satellite image, 1999 (courtesy of Loren Siebert, University of Akron). The following 25 samples associated with this volcano can be found in the Smithsonian's NMNH Department of Mineral Sciences collections, and may be availble for research (contact the Rock and Ore Collections Manager). Catalog number links will open a window with more information. Large Eruptions of Los Humeros Information about large Quaternary eruptions (VEI >= 4) is cataloged in the Large Magnitude Explosive Volcanic Eruptions (LaMEVE) database of the Volcano Global Risk Identification and Analysis Project (VOGRIPA).